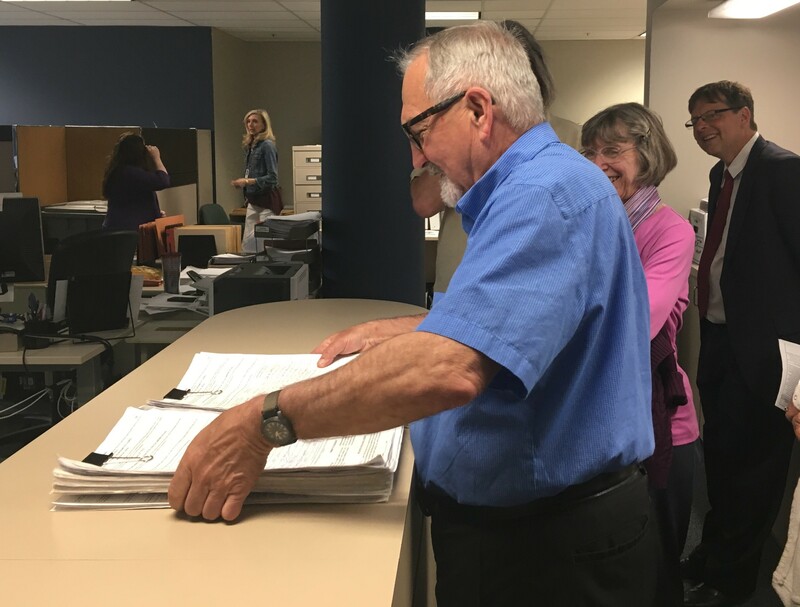 Jim Lee with the Safer Spokane campaign hands in roughly 5,200 signatures at the Spokane City Clerk's office on Monday as other volunteers and supporters, including City Councilman Breean Beggs (right), look on. The citizens initiative, which would levy a fine on oil and coal train cars unless safety measures are taken, needs about half that number of signatures to qualify for the November ballot. Dozens of oil and coal trains roll through Spokane every week, something that Safer Spokane organizers worry puts the city at undue risk. That's why the group is promoting a citizens initiative, which they're calling Proposition 6, that would essentially levy a $261 fine (per car) on the owners of uncovered rail cars full of coal, and tank cars carrying unconditioned crude oil. Organizers turned in 5,200 signatures at Spokane City Hall on Monday afternoon, more than the needed 2,585 signatures, which means city voters will likely be asked to decide on the measure in November. It's still got a ways to go, though. First, the County Auditor's office will verify that at least the minimum number of signatures match registered city voters and aren't duplicated, and then send that back to the city clerk. Then, the City Council has to agree to put the measure on the November ballot by Aug. 1, according to the Auditor's office. Along the way, it's likely to face heavy criticism, as it has already. ritics of the measure, including railroad companies, say that local governments don't have jurisdiction over rail transportation, but Safer Spokane organizers argue that Congress allows local jurisdictions to put rules in place when it comes to local safety risks. "The railcar owners could avoid liability by simply covering the coal cars and pre-conditioning the oil to remove the highly flammable liquid gas like they do in Texas," Safer Spokane states under the "Frequently Asked Questions" section of its website. "The law would not ban oil or coal trains, but would require modest safety measures to substantially reduce the chances of a fiery derailment in downtown Spokane." Spokane County Sheriff Ozzie Knezovich, who opposes the measure, says the initiative is less about safety and more about targeting fossil fuels. "It's not truly about public safety," Knezovich told the Inlander earlier this year. "This is a political argument about climate change and fossil fuels." Keep Washington Competitive says the initiative is "putting taxpayers on the hook for a legal fight and threatening local, state and regional trade efforts." "Michael Cathcart, executive director of Better Spokane, said the backers of the initiative fail to understand the greater impact this measure stands to have on the Inland Northwest economy," a Keep Washington Competitive statement reads. "This is illegal, pure and simple,” Cathcart says in the news release. “The railroads have moved fossil fuels through Spokane for decades, and rail remains the safest, most efficient means of moving these commodities. Yet because of the politics around fossil fuels, we’re willing to jeopardize a major trade network for our city, our state and our region." Supporters point out that they are not trying to stop rail traffic coming through the city, only make it safer. "This is the no-brainer initiative," says Mike Bell, a volunteer with Safer Spokane. "Or as some people told me, it's the 'I don't want to be incinerated' initiative." Oil train derailments around North America have resulted in large fires and explosions, and in the case of Lac-Mégantic, Quebec, 47 people were killed. The concern lies especially with crude oil coming out of North Dakota's Bakken shale formation, which is light and more volatile than heavier crudes. The initiative proposes requiring that shippers make the oil less volatile before loading it onto trains, which can be done through a conditioning process that removes some of the lighter gases found in crude oil. Coal on the other hand, hasn't been shown to cause issues on the level of oil train explosions, but Safer Spokane backers point to coal dust falling off trains potentially coating the tracks and creating a higher chance of derailment for other trains. In March, BNSF agreed to study whether covering coal cars would be a viable option, as part of a settlement with environmental groups concerned about the impacts coal and coal dust flying off trains may be having on local waters. The groups sued alleging the company was violating the Clean Water Act, and the parties settled, with BNSF agreeing to study the car covers and pay $1 million to the Rose Foundation for water quality and habitat improvement. BNSF denied any violations of the Clean Water Act, but also agreed to "remove significant accumulations of coal and/or petcoke materials in areas on or adjacent to BNSF's right-of-way" at several locations along the Columbia River. As for the Spokane citizens' Prop 6 (Initiative No. 2016-6), Spokane City Councilman Breean Beggs says it would make things safer for the railroads, while shifting the cost to those who own the cars (their customers). ate Robbins, a volunteer who helped gather signatures with Safer Spokane, says she got interested in the issue when she realized her son lives and teaches in what some call the "blast zone." The zone draws on emergency response guidelines that say if an oil car derails, firefighters and first responders should clear about a half mile around the tracks. In the case of an explosion, that radius bumps up to about a mile. "I got started out of concern for my family," she says. "The potential for a derailment is there all the time." She says one woman she spoke to while gathering signatures lives near the site of a corn train derailment that happened in Cocolalla, Idaho, south of Sandpoint, just last month. About a dozen rail cars filled with corn came off the tracks in the May 1 derailment, creating an accordion-style pileup of mangled metal and spilled grain. "She told me you wouldn't believe how disruptive it was, and how much metal was everywhere," Robbins says. "There was metal strewn on the (highway)." And that was just corn. The initiative's supporters expect opposition will be strong, and it's not a matter of if, but when, a legal challenge gets filed, Bell says. 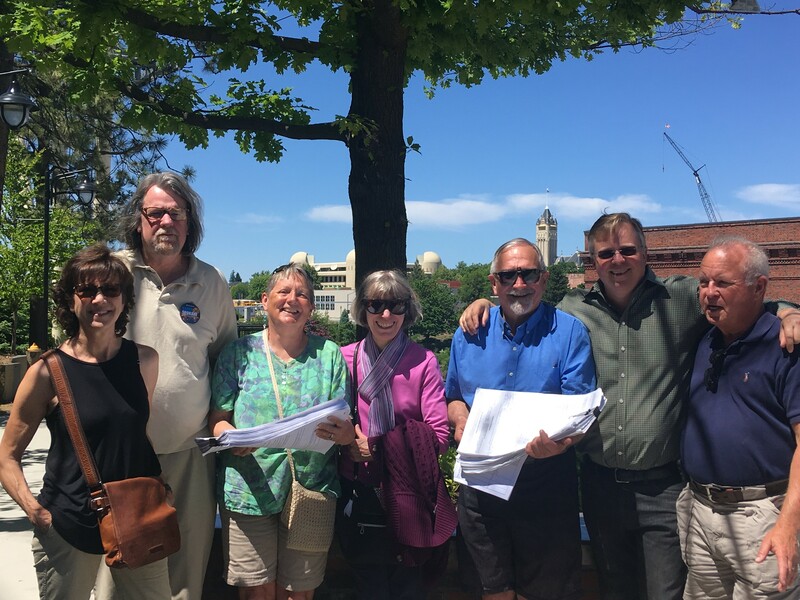 Safer Spokane volunteers pose for a photo outside Spokane City Hall on Monday as they prepare to turn in more than 5,000 signatures collected to try to put an oil and coal train initiative on the November ballot.